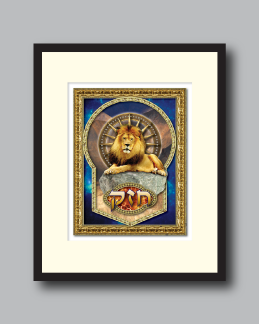 The unmistakeable presence of a reclining lion dominates the very center of this image establishing the central theme and name of this art piece: “Strength”. This majestic animal lays languidly on a large boulder, yet his face and eyes convey the emotions of confidence, strength and ferocity held in control. The open shield behind him is inlayed with diamonds, the strongest substance on Earth. Radiating points from the shield behind the lion’s head send rays of strength out into the world for us to receive and absorb. Behind the lion is a dramatic landscape of mountains and deep sky symbolizing the sometimes treacherous and rocky journey we each travel at certain times in our life. Below the boulder in the foreground resides a window which houses what appears to be electric flames. This portal represents a view into our very soul; the internal fire that moves us to resolve and action despite difficult circumstances. 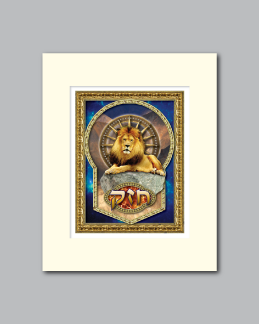 The Hebrew word “chazak”, meaning “strong” hovers above. In the very far background is a celestial blue cosmos that symbolizes the spiritual source that ignites our spirits and gives us strength to persevere. 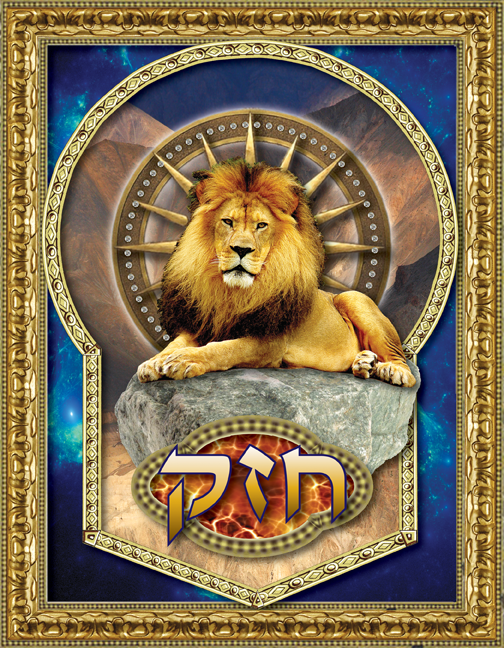 The cumulative effect of inner and outer strength transforms the lion into a symbol representing each of us. The boulder, hewn from the mountains behind him, has been conquered. He recognizes his place in the universe, drawing upon divine spiritual guidance and his own inner strength.